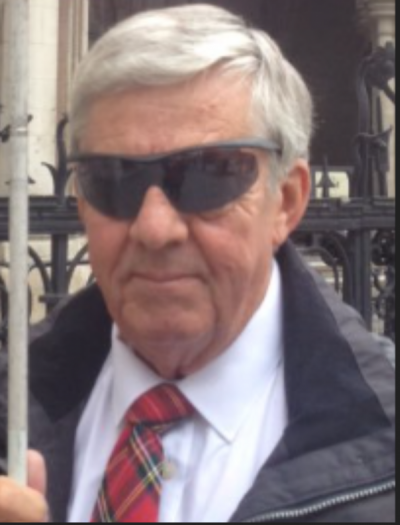 In 1991 I was diagnosed with the eye condition Retinitis Pigmentosa, which resulted in the slow deterioration of my sight over the next 20 years leaving me now blind, this is a situation which I’m sure will be familiar to other members, however like me many have proved that there is life after sight loss. I began my career in retailing at the age of 16, joining Halfords in Glasgow as a trainee. I was promoted to Manager of my 1st Halfords branch at age 20 (the youngest ever to do so) and went on to manage several other branches. I met my wife to be who was cashier at my first branch in Glasgow and we married in 1972, our Son Andrew arrived 2 years later. In 1985 I started my own business and opened my first Car Accessory/Car Parts shop at Hardgate near Clydebank, over the next 13 years, with the support of my family and the help of my staff, I established a chain of shops throughout Central Scotland from Dumbarton to Perth, employing around 30 staff. I later realised however that my sight had deteriorated to such an extent that it was obvious that I would have to give up driving. In 1998 I received an offer I couldn’t refuse from ‘Motorworld’ and sold my business. In 2009 we received the devastating news that my Wife of 40 years had developed cancer, sadly I lost her 2 years later. I joined East Dunbartonshire Visually Impaired Peoples Forum (EDVIP) 6 years ago and have chaired them for the past 4 years, we now have over 30 members. When a Shared Space Scheme was proposed for my home town of Kirkintilloch I began a campaign against it’s introduction. I campaigned in the Street,in the press, on TV and Radio and petitioned the Scottish Parliament, after 3 years the Council are finally reinstating controlled crossings and traffic lights. In 2015, I was contacted by Sarah Gayton who persuaded me to join the NFB, I have worked closely with her and EC member and Street Access Executive David Bates ever since. We are fortunate to have other active campaigners such as Bill Waddell and Sarah has recruited others throughout the country. I am also indebted to Associate member Peter Monk who is a Town Planner and Access Officer, his knowledge and experience have been invaluable in my campaign in Scotland. I feel it is imperative that we use all resources available to us, using all the skills and expertise of generous sighted volunteers in order that we campaign more effectively. To be successful in business I had to use all my managerial skills, however campaigning requires additional attributes, such as determination with a never-say-die approach as there will be many disappointments and frustrations along the way. My local Council expected me to give up a long time ago, which made me all the more determined to fight on.